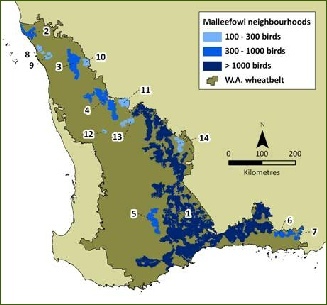 We used a combination of active mound densities from Western Australia (sourced largely through the WA Malleefowl Network), estimates of breeding birds per active mound from eastern studies, and a regional habitat model (Parsons et al., in press) to identify interconnected ‘neighbourhoods’ for Malleefowl within the wheatbelt. We identified 14 neighbourhoods, seven of which we considered viable (> 300 breeding birds), seven at-risk neighbourhoods (100-300 breeding birds), and 371 non-viable neighbourhoods (< 100). The seven viable neighbourhoods contained an estimated 36,800 breeding birds, some 94% of the estimated wheatbelt population. The seven at-risk neighbourhoods together contained some 930 breeding birds, and the 371 small and isolated ‘non-viable’ neighbourhoods collectively about 1,350 breeding birds. The largest neighbourhood (some four million hectares – shown as dark blue in the map below) extended from Beacon in the north-eastern wheatbelt to the south coast and east to Scaddan (north of Esperance), and included many of the large nature reserves of the eastern and southern wheatbelt. Our population model, although crude, provides an estimate of the overall population of Malleefowl in the wheatbelt, and an idea of where numbers are concentrated. It also helps to identify priority populations for management action, identifying apparently secure, at-risk, and non-viable neighbourhoods. This model emphasises how the conservation of Malleefowl and other species in a fragmented landscape requires management to extend beyond the patch scale (or scale of the individual nature reserve) to incorporate landscape context. A key result was that extensive farm bush and major nature reserves of the eastern and southern wheatbelt complement each other and form one major interconnected neighbourhood of c. 4 million hectares, with a number of discrete satellite neighbourhoods of varying extent and viability. Local government and farmers have a key role to play in maintaining existing connections across the landscape, farmers have a responsibility to maintain their remaining remnants by excluding grazing and some degree of fox control, and the Department of Environment and Conservation have a continuing role in the promotion of a diverse fire regime dominated by older fire ages within their large reserves and fox control in and around their reserves. Ultimately the long-term conservation of Malleefowl in the wheatbelt will require the cooperation of all land managers, private and public.